Rising from a small town in Ontario, Uxbridge, Jessica Phoenix has been an avid rider all her life. Since the age of ten, Jessica has always been an advocate of safety and has been a lifelong wearer of our Tipperary Equestrian vests. It only made sense that we would be delighted to introduce her as our Star Tipperary Ambassador for 2018! One of the nation’s leading equestrians, Jessica has proudly represented Canada on the international stage since 2007. In 2011, she went to compete in the Pan AM Games in Guadalajara, coming home with a gold medal in the individual eventing competition, along with a silver medal as part of the team, on her mount Pavarotti. In 2012, Jessica made her Olympic debut in London and finished in 22nd place in the individual eventing – the top placing Canadian, on her horse Exponential. In 2015, she competed in her third Pan American Games winning two medals; an individual silver and a team bronze, on her mount Pavarotti – this just weeks after a near-fatal fall while competing at Jersey Fresh in May 2015. Her comeback story was one of the most followed events during the games. In 2016, Jessica was named to Canada’s RIO 2016 Olympic Team, where she and her team mates placed 10th in the team competition and finished 38th individually with her mount A Little Romance. We are very proud to be bringing on a fellow Canadian into our Tipperary family. Throughout her career, Jessica has become a mentor, coach, a public speaker and a role model to the equestrian community. Jessica relies on her Tipperary 3015 Eventer Pro at all her competitions. We are excited about this partnership, and are looking forward to working with Jessica Phoenix. Eventing is a thrilling equestrian sport where a single horse and rider combination compete against other pairs across the three disciplines of Dressage, Cross-Country, and Show Jumping. This sport has its roots in comprehensive cavalry training. The competition may be run as a one-day event (ODE), where all three events are completed in one day (dressage, followed by show jumping and then cross country, where the pair must successfully navigate a course within a fixed time) or a three-day event (3DE), with dressage on the first day(s) followed by cross country the next day and then show jumping in reverse order on the final day. Cross-Country is the ultimate test of horse and rider; he course will have massive obstacles, including banks, ditches, water complexes. It is in this phase where many pairs are eliminated, and where wearing a safe yet functional body protector such as the Tipperary 3015 Eventer Pro, can make all the difference. The 2016 RIO Olympic Games (FEI 4*) had a 60% completion rate – meaning 40% of the rider combinations were eliminated in this phase. maximum mobility, attention to comfort and functional fit. 30 years ago the very first Equestrian Body Protector was developed by Tipperary Equestrian. 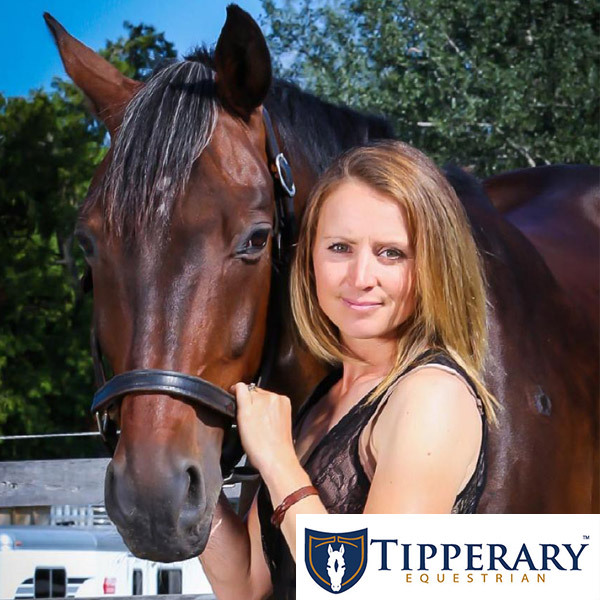 Since then, the equestrian community has come to value the experience of the Tipperary brand as it has evolved and recognized in virtually every horse nation around the world. Support of equestrian sport and it’s athletes is paramount to Tipperary’s philosophy. From Pony Club rallies to Young Riders and Olympians; we are proud to partner with grassroots programs and elite performers. For more information about Tipperary Equestrian, please go to www.phoenixperformance.com. Jessica’s success with OTTB’s (Off the track Thoroughbreds) including Exponential (Tucker) saw her place 7th at ROLEX 4* on 2007 and finish as the top placed Canadian eventer at the 2012 Olympic Games. As a trainer, she has taught horses and riders to be confident and brave; as a coach, you can often see her at horse trials – still in her competition gear, adjusting a bridle or helping a student with a motivational pep-talk. One of her favourite things to do is to coach young riders, and help them achieve their dreams. Jessica is the subject of a song, RISE- Elyse Saunders (2017) and soon-to-be-released book, “RISE: The Jessica Phoenix Story”. Equestrians can help in Jessica’s cause by going to www.phoenixperformance.com and purchasing a Tipperary 3015 Eventer Pro vest. Enter promo-code JPHOENIX18 in which a portion of the proceeds go towards Jessica’s journey.